First of all, unless you make a living from the quality of the pictures that you upload into Facebook, there is no reason why you should upload original quality and high resolution images into the social networking site. Unless you tell Facebook to by clicking on the High Quality check box as show in the picture below, Facebook by default will automatically resize and resample your pictures, anyway. This box can be found at the lower left hand corner of the picture upload page. But therein lays the problem: you spend minutes upon minutes uploading the entire files only to find when you click on your published pictures that they are nowhere near the size and quality of what you uploaded. Unless you upload in high quality, you will not even be able to acceptably print any of them. That is why, it is always better to resample and resize them already even before you upload them into Facebook. Why waste precious time, effort and bandwidth uploading pictures when it is easier, not to mention quicker, to resize them locally in your own PC. If you plan to upload just one or a few pictures in an album, it is alright to upload the originals. It is when you are uploading whole albums when the time used increases exponentially. 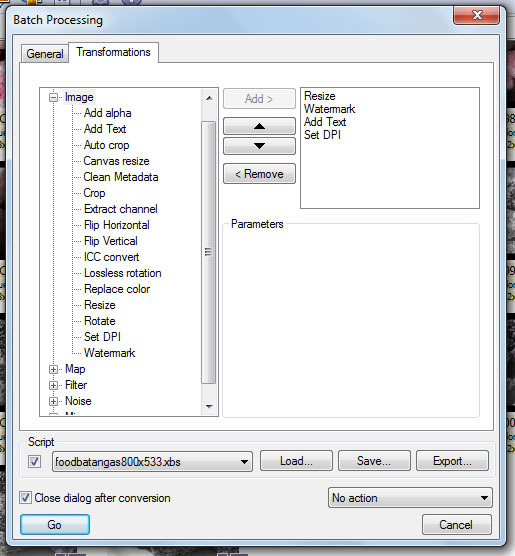 Thus, it is better to resize them using third party graphics editing and manipulating software. In my case, I use XnView, a freebie graphics viewing and editing software with batch processing functions. I cite this as an example and I am in no way an official endorser. 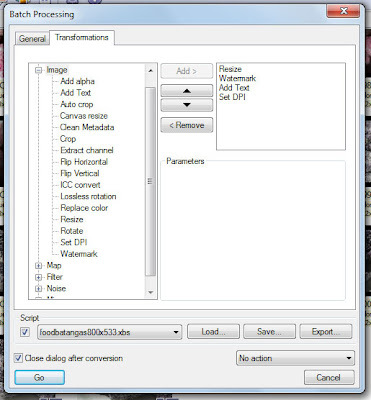 There are many other freeware graphics handlers in the Internet. Batch processing refers to treating multiple files to the same process, something like a mini-program within a program. This enables me to resize any number of pictures with the ability to save the processed pictures in a separate folder without touching the originals. Take a look at this picture which in its original form is all of 3.67MB. The picture that you see has been automatically processed to 800 by 533 pixels and reduced to 172KB from 3.67MB. Here is the XnView dialogue box that enabled me not only to resize but automatically insert the watermark Food Batangas. There you are, then! The tip here is to resize and resample your pictures before actually sending them to Facebook to shorten upload time. For those interested in acquiring XnView, here is the link to its web site: XnView. This graphic viewing and editing software is freeware and therefore free.